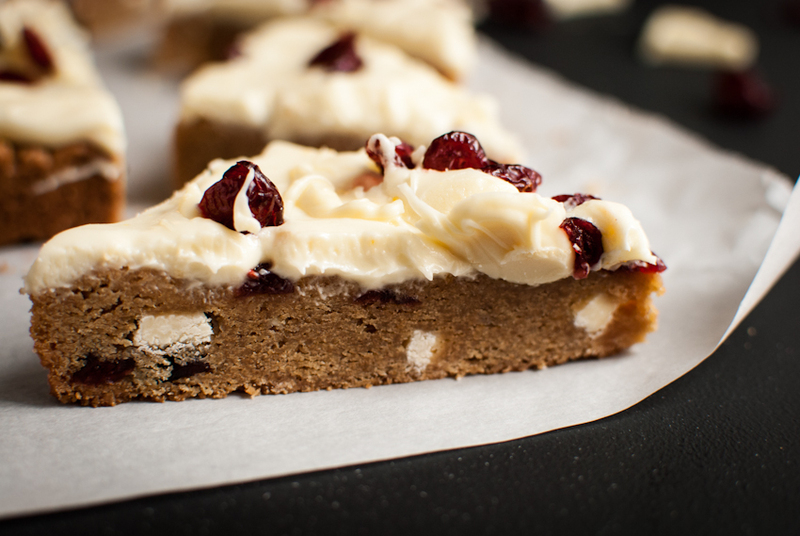 You know when a certain coffee shop ( you know the one, my least favorite one) brings in their Cranberry Bliss Bars on Nov 1st…that means the rest of the holidays are seriously close! All the scary spooky decorations have left the store, or at least put on the clearance racks, and out comes the red, green, yellow, red and rest of the holiday decor. My mind immediately goes into Thanksgiving mode when Halloween is over. I mean, you really only have 3 weeks to get the menu planned out, and maybe do a test run on some new things you might make this year. 3 weeks! That’s not long guys…not long at all! 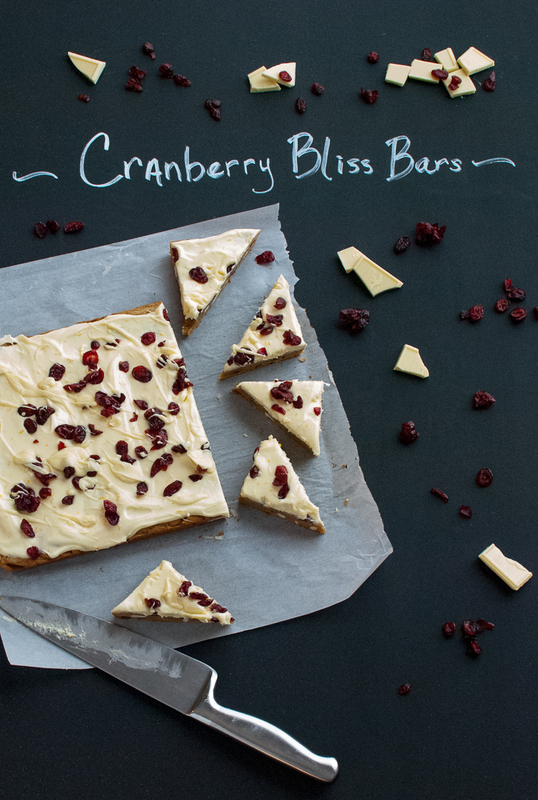 Well, if there is one sugary treat you must bake this holiday season, it is the Cranberry Bliss Bar! Oh my heaven in a cookie bar! If you are a cranberry fan, you will love this. I’m sure you have had them at that one coffee shop, the one we don’t like to mention over here, and they are heavenly! The tartness of the cranberries with the sweet smooth white chocolate and cream cheese frosting…oh you will forget all about the holiday planning stress! 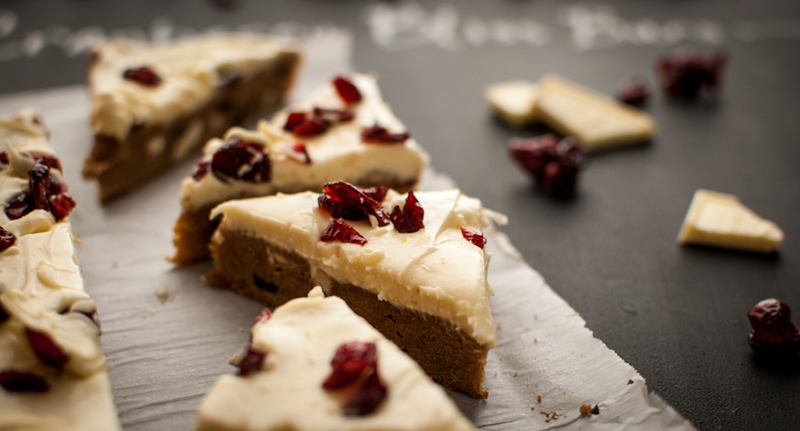 Baked like a blonde brownie, with loads of white chocolate and cranberries, the cream cheese frosting with fresh squeezed orange juice and orange zest makes it that much yummier. The frosting on the cake, the cherry on the sundae, however you want to say it! Bake a batch and keep them in the fridge for a few days (if they last that long!) and spread some holiday love with your friends and co-workers. Or if you really need to kiss some booty, take a batch to your boss! Going to a pot luck?…these are perfect for that too! Preheat oven to 350, line a 9x13 pan with parchment paper. Melt butter and pour into a large bowl. Mix brown sugar and butter together with a mixer until combined. Add the eggs and vanilla and mix. In a separate bowl, add the flour, baking powder, salt and cinnamon, whisk until mixed. Add the flour mixture to the wet mixture and mix until smooth. Add the chocolate and cranberries, and mix by hand until incorporated. Spread batter in the pan, and bake for 18-20 minutes, until bars are set. For the frosting, beat cream cheese and sugar on medium speed for about 1 minute. Melt 4 oz of the white chocolate and add to the cream cheese mixture. Add the orange juice and zest, mixing on high for about 1-2 minutes. Spread over cooled bars and sprinkle the cranberries on top. Melt the last 2 oz of the chocolate and drizzle over bars. Makes about 24 bars. Store in the fridge until ready to serve. Thanks Renee! I will check yours out for sure! Oh my goodness! These look amazing! I’ll have to give it a try! I love these at starbucks and i’m sure it’s even better homemade! These sound so delicious! These and the holiday red cup (how I start the holidays!) go perfectly together! I love your photography too… amazing! Thanks Kayla! Cheers to the holiday season! This is my go to for bliss bars, been making them from this recipe for 2 years now…..a little different than Starbucks, but very yummy as well.